The share of renewable sources in 2011 amounted 18.8 % which was 6 percent points lower of the target in 2020. Compared to the year before it decreased because of a greater reduction of consumption of renewable energy sources compared to the reduction of final energy consumption. The indicator shows the consumption of renewable energy sources, including energy consumption from the sun, biomass (wood, biogas, biofuels) and waste, geothermal energy, water and wind, in final energy consumption. The gross final energy consumption represents an energy product supplied for energy purposes in industry, transport, households, the service sector, including the public sector, agriculture, forestry and fishery, including the electricity and heat consumed by an energy sector for the electricity and heat production and losses of electricity and heat in distribution and transfer. Jožef Stefan Institute, 2012. Statistical Office of RS, 2012. 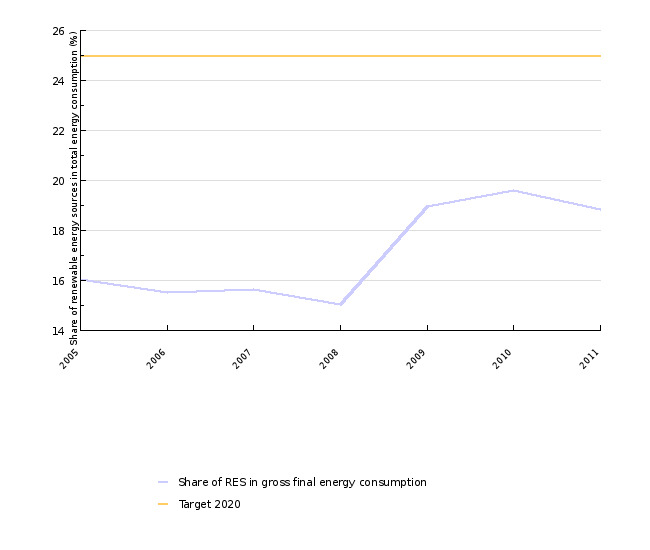 - 10 % share of RES in final energy consumption in transport in 2020. Objectives summarised by: Resolucija o Nacionalnem energetskem programu (ReNEP) (Resolution on the National Energy Programme, Official Gazette of the RS, No. 57/04) and Directive 2009/28/EC on the promotion of the use of energy from renewable sources. Source database or source: The data after 2002 were obtained from the SORS webpage in the SI-STAT Data Portal (Environment and natural resources > Renewables and wastes > Renewable energy and waste use, Slovenia, annual). Data administrator: Statistical Office of the Republic of Slovenia (Jože Zalar). Date of acquisition for this indicator: 5 December 2009. Methodology and frequency of data collection: The data are prepared on an annual basis. The Statistical Office of the Republic of Slovenia monitors the use of water power, biomass (wood, wood waste, other renewable waste), biogas and industrial as well as municipal waste. Data processing methodology: The share of renewable sources in final energy consumption is calculated as a quotient of the gross final consumption of renewable energy sources and gross final consumption. The gross final consumption of renewable energy sources is calculated as the sum of the gross final consumption of electricity from renewable sources, gross final consumption of renewable energy sources for heating and cooling and final consumption of renewable energy sources in transport. 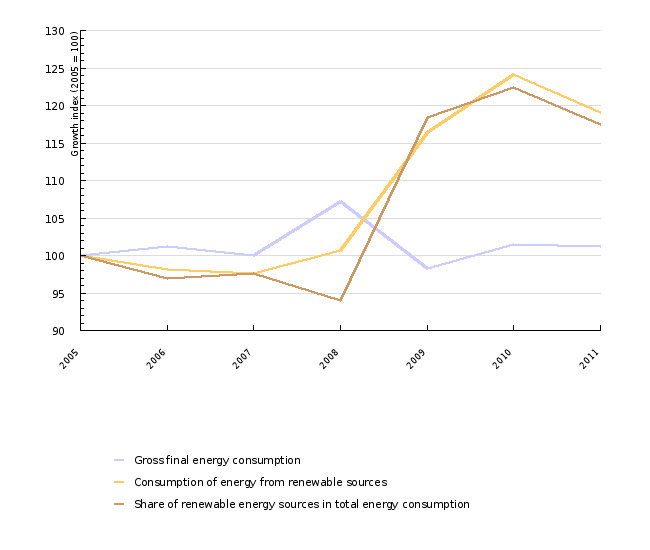 The indicator is shown in relative (share of renewable energy sources) units. For the calculation of the share of RES in total energy consumption, the gross final energy consumption was the denominator (electricity gross production in Slovenia, final energy consumption in transport, industry and other consumption (households, services, the public sector, agriculture) and the consumption of electricity and heat in the energy sector, the consumption by power plants and losses in the transfer of electricity and heat), and the final energy consumption from RES was the numerator (direct consumption from RES in final consumption, electricity gross production from RES – production in hydroelectric power plants was normalised, heat production from RES). - Advantages and disadvantages of the indicator: The use of wood biomass that represents the most important renewable source is assessed every five years; therefore, it does not provide the possibility of monitoring the trend of the use of wood biomass. Furthermore, SORS also does not monitor the use of solar and geothermal energy. The data until 1999 and afterwards are not comparable due to differences in the assessment of the use of wood biomass. Reliability of the indicator (archive data): The reliability of data is limited. - DIRECTIVE 2009/28/EC of the European Parliament and of the Council on the promotion of the use of energy from renewable sources and amending and subsequently repealing Directives 2001/77/EC and 2003/30/EC. - EUROSTAT, 2009. 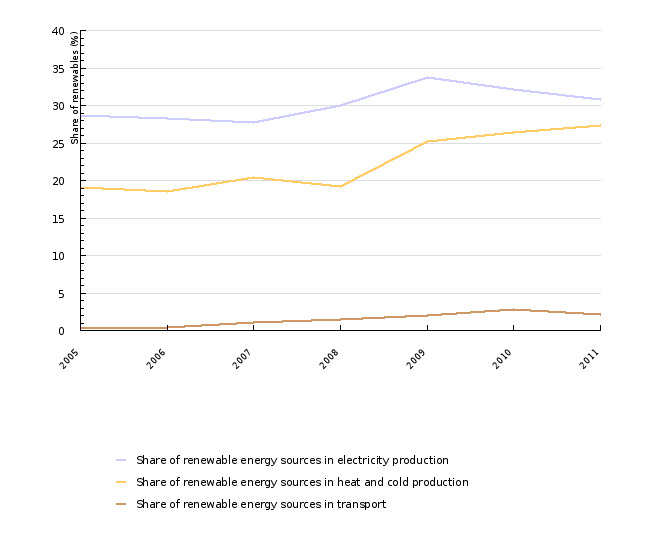 Energy, transport and environment indicators, 2008 edition. - Ministry of the Economy, 2008. Letni energetski pregled za leto 2007 (Annual Energy Review for 2007).